I've ordered the yarn for the Daily Sweater. While I'm waiting for it to arrive, I pulled a skein of Mountain Colors Weavers Wool Quarters and started a scarf using the Yarn Harlot's pattern for a One Row scarf. The pattern is easy. I had forgotten about this yarn until I pulled it out. I love the colors. It's called Missouri River blue. Remember this yarn? I posted about it before (just that I had purchased it). My intention was to knit a striped scarf, like my last one, using this yarn. 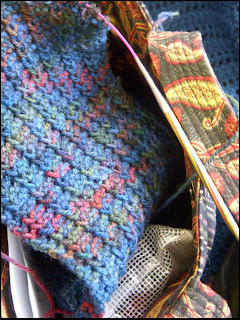 I cast on, using Brooklyn Tweed's pattern for a Noro scarf, which I did. I knit about 8 inches. The pattern is fine, and it produces a thick 1x1 ribbed scarf. The edges are particularly well done by slipped both end stitches on the second stripe in the pattern. But the colors. Ick. Look at that skein. It looks bright a pleasant. I liked it. I still like it. Knitting that pattern with it? With the particular way the yarn is would? Mud. The scarf looked like mud. I disliked it so much that I ripped it apart and rewound the yarn. Unusual for me. I usually just loose interest in something ugly and put it away while I start something else. Not this time. It's gone, and the yarn is back in the stash. On another front, the swatching for the Daily Sweater is coming along nicely. I did three swatches (can you believe it?) -- one in each color. I started with pomegranate Comfy on a size US7 needles (which is recommended in the pattern. The stitch per inch count was too large. This makes sense, since I think this yarn is thicker than the recommended Calmer. 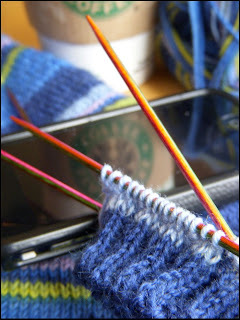 So, down a needle size, to a US6 and swatching with the blackberry. Hit the stitch gauge right on target. Amazing. I've washed the swatches and will remeasure the US6 one again today. And order the yarn. I also knitted a smaller swatch (for color purposes) with the planetarium. In this one I practiced the twisted stitches requires in the pattern. I like all three colors, but for this project, it will be the pomegranate. I mentioned earlier that I finished three projects in January. This scarf is one of them. I started it in 2007 as a simple project to take on a Youth retreat. It went to Spring Heights -- our Conference retreat center -- two years in a row, so whenever I look at it, I am reminded of quiet times in the cabin. It's a great association to have with a scarf. The pattern is simple. It's knit on the bias, with alternating blocks of garter and stockinette stitch. It's actually very close to an alpaca scarf I made a few years ago. Pattern: Diamond Scarf from Vogue Knitting Scarves. Easy to follow pattern, although this one is altered from the original. 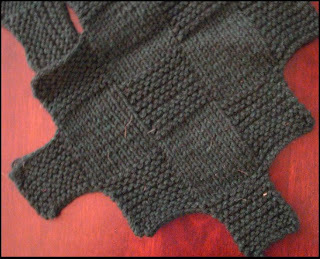 I think in the original pattern, the squares were 12 stitches by 20 rows, and this one is 10 stitches by 16 rows. The only tricky part is that you need to know how to do a knitted cast on, for which I found instructions online. Yarn: Forest Green Cascade 200. I think I used more than one skien but less than two. It's hard to remember over 2 years. Needles: I used a US size 7 lattern moon needle. Love the lantern moon needles! Finally! They are finished. 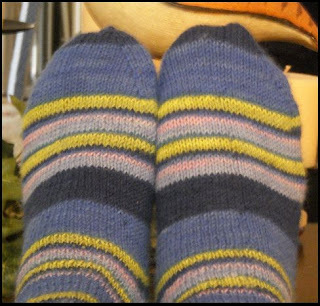 Add this pair of socks to my finished objects list. Look. I did it. The socks are identical twins! Pattern -- From Knitting Rules by Stephanie Pearl-McPhee. I used her Step by Step pattern for socks. it's really well written, and easy to follow. The heal is different from ones I have done before. Yarn -- ONline's Supersocke 100. There is no color listed on the ball-band,, but it's a lighter blue, a darker blue and stripes of lime green and pink. I used one skein, and I had lots of it left. Needles -- Five harmony sock needles, size 1 (2.5 mm). Have you ever been done with a project before you were finished? Of course, you have! I'm ready for the pair of socks to be finished. I've got about three inches of foot left and then the two on the second sock. It won't take long. My problem is that yarn arrived yesterday in the mail for swatching. I want to try my hand (hands) at a sweater. I've never done one before (although I have done a vest). I want to try the Daily Sweater (Ravelry link) from Outside the Lines (Mason Dixon's second book). I ordered three skeins of Comfy from KnitPicks (one each in blackberry, pomegranate and planetarium) so that I could choose a color and do some swatching to see if I like the yarn. THEN, if I do, and if it works for this project, I'll order enough to make the sweater. But, I've got these socks to finish first -- I'm determined to finish them before swatching with for the next project. I've enjoyed having finished projects, and I know if I stop knitting the socks now, I won't finish them (until much later). One day or two is all it will take, THEN onto the next thing. How about a work in progress update? 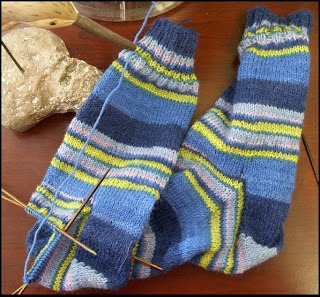 I'm currently working on a pair of socks using a self-striping yarn called ONline Supersocke 100 Sport. The pattern is the Yarn Harlot's sock pattern from Knitting Rules. REALLY enjoying working with these needles. I bought the whole set -- size 0 through size 3(?). Each set comes with 6 needles instead of 5, which is a nice addition, too. -- kind of a description of who I am. How about some talk about stash enhancement? Here are two yarns I recently purchased. 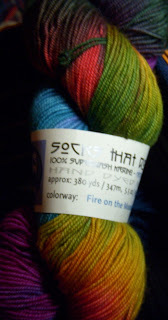 The first is a skein of Socks the Rock, mediumweight, in Fire on the Mountain. It will become socks, although I'm not sure what pattern yet. The second is a skein of Noro Kureyon, in color #187. It's very rainbow-ish. I think it, and the other two skeins of it that I bought, will become another stripped scarf, this time in a 2X2 ribbing pattern. I read the latest Mason Dixon book over the past few weeks. This one is called Outside the Lines. It has the same great tone of the first one. I enjoyed it. Daily Sweater -- this is a top-down sweater using a cotton/microfiber yarn. The specified yarn is Rowan Calmer (which is $12 per skein). I'm hoping to be able to substitute Knitpicks Comfy, which is the same fiber makeup, but is only about $2.50per skein. I've ordered one skein of each of three colors -- Blackberry, Pomegranate and Planetarium. I thought I would play around with colors and do some swatching before committing to the yarn or the pattern. There are a pair of cabled socks that look like fun to knit. I have some green sock yarn that I might try with this pattern. For some reason I always think of cables as being green. Why is that? There are lots of patterns that I won't try, but I enjoyed the whole book. It is wonderfully photographed and written with such a great tone. Really enjoyed it, just like the first one. I have found that a great way to return to knitting when you have the "bug" is to find unfinished projects in your stash and finish them. This is one of those projects. The beginnings of it are in this post -- January 2006. I finished it in January 2009. Pattern -- From Vogue Knitting's Scarves Two -- the rib and stripe scarf. 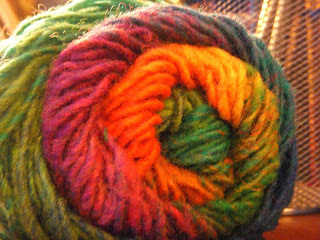 Yarn -- Noro Kureyon -- I used three balls. (color? I'll have to look it up because I don't have it here, but the photograph in the post linked above probably shows it better. Thoughts -- This scarf is knit by starting with two balls of Noro yarn, with its wonderful color changes. By starting with each ball in two different color areas, and then knitting with the balls alternating, two rows each, some very nice striping naturally happens. I was very entertained by watching the colors change, and because its the same yarn colorway, the changes kind of flow through the scarf. Hard to explain, but I like it. If I did this again, and I plan to (in fact I already have the yarn), I would do a 2x2 ribbing instead of the knit 3, purl 1 ribbing called for in this pattern. This scarf rolls. I knew it would when I was knitting it, but I had blind faith in the pattern. I would (and will) change it for next time. It's warm. Amazing how warm wool is! And I love wearing something so colorful while the winter is so drab. To say that I haven't been writing on the knitting blog is an understatement. I haven't been knitting. I write daily on my other blot (Sandpiper's Thoughts), but when you're not knitting, there is no real reason to write on a knitting blog. I picked up a copy of the Yarn Harlot's book, Free Range Knitter, and all of a sudden, I wanted to knit again. So I have been. By the way, great book. I really enjoyed it! So, I'll start posting again. 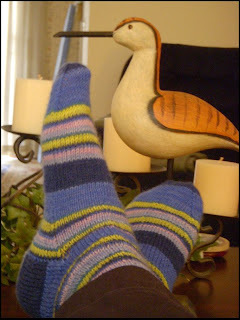 So far, I have three finished objects and one sock that are finished, plus plans for more knitting. It's great to be enjoying this hobby again. While I wasn't knitting, I was working with beads, so that was fun. I've also been enjoying photography. I haven't been without creative outlet, but it just hasn't been knitting. To celebrate the rebirth of the Knitting blog, I gave it a new look -- new template. I'll fiddle with it over the next few weeks -- more pictures and links.